CHRONIC ILLNESS. OBESITY. AUTOIMMUNE DISEASE. CANCER. ARE THESE RELATED TO AN ANCIENT WAR ON GOD’S CREATION? 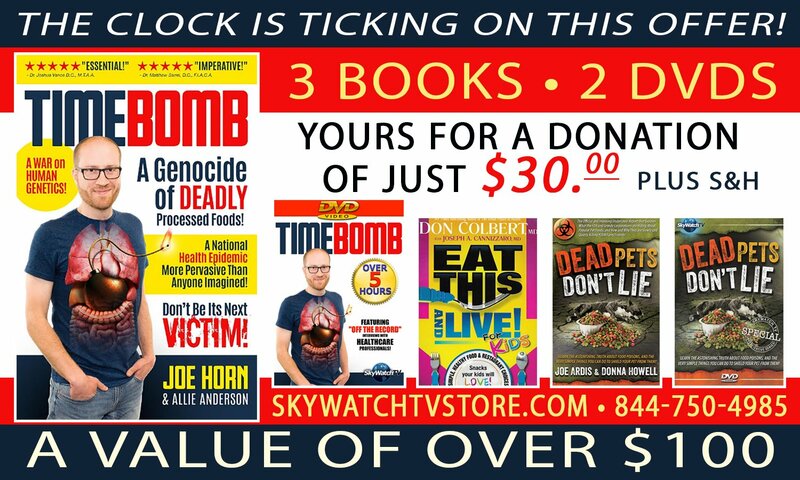 Starting online now and in this month’s SkyWatch Magazine and for several editions to come we look at the new work TIMEBOMB by myself and co-author Allie Anderson and shocking discoveries and amazing mind-body-spirit connections it examines. Why? Because there is a genocide of deadly processed foods and a global health epidemic more pervasive than most can imagine, it is connected to an ancient war against God and His imagers, and you don’t have to be its next victim! As many as 80% of Americans are carrying this Timebomb medical-crisis in their bodies right now, unaware they will soon develop prolonged illness. Perhaps, as you are reading this, you are one of the millions of Americans already exhibiting symptoms such as: fatigue, migraines, brain fog, energy “spikes” followed by “crashes,” digestive issues, hormonal imbalance, constant need for antibiotics, or even premature aging. Or, maybe it’s worse, and you’ve been diagnosed with diabetes, Crohn’s disease, lupus, fibromyalgia, chronic fatigue syndrome, arthritis, food allergies, irritable bowel syndrome, or one of many other debilitating conditions. If this is the case, the groundbreaking information within this new book is imperative and will help you take charge—like millions of others are—in order to reverse the course of a declining health situation. The average American citizen races through daily life at what seems like the speed of light. We wake up, down a cup of coffee, and grab a snack that we call breakfast (if we’re lucky enough to remember breakfast at all) before hurrying off to work at high stress levels until noon. Once our lunch break has begun, we dart erratically across town, running errands while scarfing a burger and fries that we scarf down with a super-sized soda. When the lunch hour is over, we breathlessly return to our stress-infused jobs in workplaces that are often illuminated by only artificial light. There we spend the rest of the afternoon until it is time once again to pile into the car, traverse through gridlocked traffic amid road-raged antagonists until we finally arrive home. Before our next round of duties—kids’ homework, laundry, taxes, bills—we cook a “home-made” meal of Hamburger Helper, mac & cheese, or some other prefabricated food and wash it down with a healthier drink than our lunchtime option, such as Gatorade or fruit juice. (After all, we’re at home with the kids now, and we wouldn’t want them eating the way we did at lunch, so we go the extra mile for them by cooking and avoiding soft drinks.) Before bed, we enjoy some sort of indulgence such as ice cream, a sugary dessert, or possibly even candy. This is a normal scenario in our society. I know this because I was guilty of this routine for years! At this point, the reader may retort that people are doing this because they’re not being prudent about their health, or because they don’t care. These people are often written off as careless with their own health and the health of their children. But let’s set that reaction aside for a moment and take a closer look at our society’s habits. What is the real motivation behind our continued poor eating habits? Many of us are aware that we’re eating unhealthy food. Yet we have somehow been lulled into complacency about the subject. Why? Most Americans don’t judge each other for living this way; it seems like the machinations of our modern lifestyle have simply turned, landing us all at a point where this is all we feel we have time for. Many parents, trying to do their very best for their children, look at this picture and feel dividedly remorseful. On one hand, they admit that this portrayal matches up with an average day in their life, yet they are simultaneously rueful that they can’t be more proactive about their children’s health. I know several parents who admit that the food their children are eating is not ideal, but between working full time and juggling the many responsibilities of life, they feel powerless to take control of the situation. One working mother teasingly said to me recently (while shrugging off the apparent hopelessness that had pressed her into submission): “I don’t have time to become some rocket-scientist-health-guru-organic chef!” It’s an understandable dilemma. I would wager that part of the issue at the core of our complacency is that we don’t realize how dangerous our food is. To people who haven’t taken the time to learn about what they’re putting into their bodies, the idea of our food being substandard is an ambiguous, looming cloud of vagueness over our heads that we know may someday catch up with us. But as long as the byproducts of such unhealthy habits do not manifest themselves in the form of symptoms or illnesses, we continue to deal with our “more immediate needs”—the demands of daily life—hoping that sometime soon we will finally have the “time and resources” to tackle the issue of our food. If only the average consumer truly understood how dangerous their food is, they might consider it a more immediate need to address the threat of our diets. When we are aware of a fire hazard in our house such as faulty wiring, we don’t ignore it for years until the house finally catches fire. If our vehicle shows signs of an issue with brakes or steering, we take it to a shop for repair. Any time we see impending danger, we address it. So, when it comes to food, our lack of awareness of the important issues involving it is where the biggest danger comes in. We wouldn’t be so complacent if we understood how far down the rabbit hole goes. Notable about this subject is that, as consumers, our greatest weakness—lack of knowledge—can also become a strength. Once we change the way we think about food, then we can meet the seduction of advertising, the trap of complacency, and the hopelessness of confusion with recognition and resistance. The antidote to the absence of knowledge is education. Knowledge is power. Consumers are not without power. We just have to learn how to take it back. Once we’ve done so, we can find healthy food for our families no matter how much junk floods into the marketplace. Since you are reading this article, it is possible that you weren’t alive in the early 1900s, when the average woman spent forty-four hours per week in the kitchen[i] preparing all meals from scratch. In the 1950s, time spent preparing the family’s meals had decreased to twenty hours per week. [ii] In the present-day household, women (or men) average less than ten hours per week on food preparation and cleanup, with some clocking no time at all on food prep. On top of this, 44 percent of the money spent on food today is done so at restaurants! [iii] The statistics for the younger generations are even more shocking: The average Millennial spends less than twenty minutes a day on food prep and doesn’t even know how to cook. [iv] The irony is that as our confidence in, interest in, or ability to prepare our own meals has declined, our kitchens have become larger, more glamourous, and better equipped than ever. Many households don’t have even one member who knows how to cook without the aid of a pre-boxed meal kit. Huffington Post recently reported that 28 percent of Americans don’t know how to cook,[v] while other studies, such as a recent one conducted by the Department of Health, shows that only one in six mothers makes a meal from scratch each day[vi]. We as a society have let our guard down concerning food. Advertising now appeals to our emotional mind, instead of our practical mind. Doctors (or actors portraying doctors) wearing lab coats endorse the healthy attributes of particular foods, and words and phrases like “natural” and “no sugar added” are tossed out like a safety net to persuade trusting shoppers to purchase the least of all evils for their families. Consumers cling to the hope that “they” (“they” being a higher power governing food safety on behalf of the consumer, which we will discuss in an upcoming article) are vetting the products on the market and scrutinizing everything that is sold with tight safety standards. Is the modern consumer tricked? Those of us who aren’t fooled into believing our food is healthy, as stated before, might say we don’t have time to address the issue. Others, because of our lack of knowledge, feel helpless and simply shrug off the problem, hoping they will be among the lucky few who dodge the bullet that is the food they’re eating. Yet others laugh and pretend they don’t care—and maybe they really don’t. Such an apathetic stance is also a direct response to the core problem. But, we are intelligent, educated people, right? We have all the tools available, we have the big kitchens, we are surrounded by “food,” and are generally a bright, progressive generation. We rally about, advocating for human rights, the environment, endangered species, religious world views, and any other causes we feel are worth protecting. So why not speak out about the health of our bodies? Why not advocate for our right to healthy food choices? Just what is the underlying problem? Again, I don’t believe most of us understand exactly what we’re putting into our bodies and how dangerous most of those foods and drinks are. We watch with vigilance for obvious enemies. But much of what we eat is an enemy invader waging war on our immune systems and affecting our bodies. And, when is an enemy ever intentionally obvious? Stealth is all too often used by an enemy as a tactical advantage. When you look around your environment for the enemy, you’re probably not thinking about checking your cabinets. Like many, you’re probably looking for obvious combatants—illegal drugs, alcohol, even tobacco products—while the seemingly safe food in your kitchen is likely more toxic than you know. Allow me to turn to a mythological tale that presents a useful analogy in many Americans’ views about the food we eat. Legend has it that the Greek god Caerus, son of Zeus, was noted for the single lock of hair atop his head. The only way to catch this god, as mythology has it, was by gripping this lock of hair as he headed toward you. Once he had passed you, there was no catching him, as his backside had nothing to grab. Those hoping to catch him had to see him coming, clutch that lock of hair, and hang on before their chance was gone. Caerus was the god of opportunity, bringing about what was “just in time and convenient,” as the legends say. His was the way of last-minute convenience. He was beautiful to look at, always on tiptoe, and had wings on his feet for the swift movement in flight. He was also known to show volatile, hostile behavior toward humans, and was often even said to have drunk their blood. Consider the parallels between this ancient Greek entity and our society’s affinity toward anything that requires minimal effort. Favorable, easy opportunity, in a swift and timely fashion, holds a very attractive seduction for us in our hurried lifestyles. Many of us move throughout our day, racing at the mercy of everything that comes at the last minute and through expedience. We move as if we believe we had wings on our own feet, but perhaps we are really dancing with an entity that would drink our blood. Am I saying that by driving through a fast-food restaurant for a cheeseburger, we’re worshiping Caerus, son of Zeus? I wouldn’t go that far. But I am saying that just like Caerus, we must identify and seize the problem rapidly approaching us, because it is an entity that offers convenience, but it is hostile (even blood-drinking) to humans. We only have a certain amount of time to reach up, grab that lock of hair, and hang on tight, putting up a fight for our safety. Once the opportunity to fight for our well-being has passed (and on his backside, we have nothing to grip), no method of subduing the enemy is available. This could leave us having missed our opportunity for change, and we could be left with diabetes, cancer, or some other kind of illness that is potentially irreversible. With that in mind, in the next entry I will tell you how easy it is to identify and avoid toxic food additives and chemicals beginning with THE WORST INGREDIENT IN MODERN FOOD! [i] Coleman, Marilyn., Ganong, Lawrence H., and Warzinik, Kelly. Family Life in the 20th-Century America. Greenwood Press, Westport Connecticut, 2007. P. 51. [iii] Talty, Alexandra. “New Study Finds Millennials Spend 44 Percent of Food Dollars On Eating Out.” Forbes, 17 Oct. 2017, https://www.forbes.com/sites/alexandratalty/2016/10/17/millennials-spend-44-percent-of-food-dollars-on-eating-out-says-food-institute/#1b5a3e8a3ff6. Accessed 19 Dec. 2017. [iv] Lamagna, Maria. “Why Millennials Don’t Know How to Cook.” Market Watch, 10 Sept. 2016, http://www.marketwatch.com/story/why-millennials-dont-know-how-to-cook-2016-08-10. Accessed 18 Dec. 2017. [v] “Cooking Survey Reveals That 28% Of Americans Can’t Cook.” Huffington Post, 9 Sept. 2011, https://www.huffingtonpost.com/2011/09/09/cooking-survey_n_955600.html. Accessed 18 Dec. 2017. [vi] Lawson, Helen. “Only One in Six Mothers Cooks from Scratch Each Day Because They Lack Time and Confidence in the Kitchen.” Daily mail, 8 Mar 2013, http://www.dailymail.co.uk/news/article-2290106/Only-mothers-cooks-scratch-day-lack-time-confidence-kitchen.html. Accessed 18 Dec. 2017.